US Rail Transit Hits the Trifecta! Voters in the Capital Metro service area of Austin, Texas "resoundingly" approved the agency's referendum to bring passenger rail service to the region, according to the Austin American-Statesman. The proposal for an initial 32-mile "commuter rail" service, connecting downtown Austin with the northwest suburb of Leander, passed with 62.2 percent of the vote. if all goes as planned, Capital Metro would open passenger service on the railway (currently used for freight rail service), with 9 stations, by 2008. "We are officially declaring the victory" Capital Metro board Chairman Lee Walker told supporters at about 10 PM Tuesday (election night), to roaring, sustained applause at an election night party at Nuevo Leon, a popular restaurant in East Austin, the predominantly minority section of the city. "I think this is a really big deal. This is the first time our regional neighborhood has come together.... We should be proud we're a part of it." Rail opponents, while sour, hinted that they would be continuing their efforts to roadblock rail and transit development. Jim Skaggs, a familiar local leader who fought rail in the ill-fated 2000 referendum as well as in the latest one, groused that "The battle is lost in terms of this particular election. But I don't think the war is lost." Referring to the 32-mile rail service planned, Skaggs added, "This rail will demonstrate that it is an ineffective use of transportation dollars." However, Capital Metro representatives and the proposal's outside supporters underscored that the line is a relatively low-cost start toward a larger, regionwide system of rail lines and expanded bus service. With the area's population predicted to double over about 20 years, they argued, Central Texas's traffic problems seemed headed for what the Austin American-Statesman characterized as "nightmare status". Capital Metro says it will use diesel-powered cars, similar in scale and look to a light rail car, with an engine and driver's cab at each end, allowing cars to reverse direction without some sort of turnaround. initially, the agency would run about 14 trains a day, four or five south from Leander in the morning on 30-minute intervals, with one or two in the reverse direction, and the reverse of that approach going out from downtown Austin in the afternoon. There likely would be a couple of trains at midday, one in each direction. The stations, by and large, would be simple affairs with a raised platform, some shelter, a ticketing machine and some seating. At busier stops, the stations could be more elaborate, and a few will have park-and-ride parking lots. The agency also plans to have "circulator" buses waiting for the trains at its final stop near the Austin Convention Center to ferry people to the rest of downtown, the Capital complex and the University of Texas. Buoyed by the overwhelming approval of rail, Capital Metro planners seem to be revving up plans for additional rail expansion. These includes two more regional "commuter" lines, a possible streetcar system, light rail lines in Central and South Austin, or the extension of some type of rail service across downtown. Under current law, any such expansion would require one or more additional referendums. "Such a vote, however, could come sooner than later", reports the American-Statesman. According to the paper, Capital Metro officials have already indicated that "the studies necessary to bring another referendum to the ballot could be done in time for the 2006 election." In the Denver urban area, FasTracks, the Regional Transportation District's 12-year construction program for rail and bus improvements, was approved Tuesday (2 November) by "a large margin", according to local station WUSA-TV. Known as Referendum 4A, the transit measure will install 119 miles of new rail transit, add 18 miles of "bus rapid transit" (Quality Bus) on the Boulder Turnpike, and expand suburban bus service. Voters approved a 0.4-cent increase in RTD's sales tax to help pay for the network. The resounding election victory crowned other good news for Denver's transit system, especially LRT. According to a report released by RTD on Friday (29 October), this past September average weekday transit ridership in metro Denver exceeded the 300,000 average mark for the first time. Bus and LRT weekday passenger trips went up 4.3% over September 2003, hitting an average of 303,460. The total monthly trip count, including weekends, was 7.42 million, RTD added – a 5% increase over the monthly total of a year earlier. LRT ridership rose an even more spectacular 6%, to an average 968,077. Rail and transit supporters were ecstatic over Tuesday's electoral success. "We have to give people an alternative as we accommodate this growth in those corridors where the congestion will be the worst" emphasized Maria Garcia- Berry, campaign manager for FasTracks Yes! "This is an efficient way of moving people through the metro area" noted Garcia-Berry. Light rail moves people very efficiently and it gives people a choice." She added, "We have to cut into the growth rate of congestion." 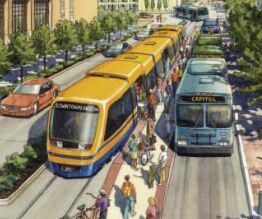 Denver Mayor John Hickenlooper, described as "one of the measure's most prominent supporters", commented that the FasTracks "helps people have a shorter [commute] time so they spend more time with their families" and "It helps focus development in certain areas so that we keep more open space." "The whole community came together in the region at a level that we've never seen before" Hickenlooper added. In Phoenix, LRT and transit backers were also jubilant as voters okayed Proposition 400, authorizing an extension of Maricopa County's half-cent sales tax for another 20 years, a measure which would raise $8.5 billion toward the cost of a proposed $15.8 billion regional transportation plan that includes 78 miles of new freeways, expansion of the bus system, expansion of the already-approved local LRT system, and improvements to major arterials in the roadway system. With 70 percent of the precincts reporting, Proposition 400 was approved 58 percent to 42 percent. According to the Arizona Republic, "Jubilant local mayors called Proposition 400's strong showing a sign of positive public sentiment about mass transit and a good omen for future regional cooperation on other issues...."
While the regional transportation plan approved by voters will finance approximately $2.3 billion worth of extensions into Phoenix-area Valley suburbs, nearly three-fifths of the money authorized will be used to build new freeways and expand existing routes. However, what was especially significant was that voters in all areas of the Valley apparently opted for more than simply freeways, making former US Rep. Matt Salmon, described as "an avid supporter of the plan", jubilant. "I think it tells us very, very clearly that people want not only freeways but mass transit" Salmon said told the Arizona Republic. The mass transit sweep appeared to be the case even in the politically conservative East Valley, a fact which which Salmon called "the most pleasant surprise of all." Opponents of Phoenix's rail program seemed shaken. "The voters can make the decision, and they can't say they weren't informed" said Dave Thompson, who had led the No on 400 campaign. Thompson, a millionaire from the suburb of Gilbert, who had and financed much of the anti-rail campaign from his own pocket, added, "If the voters decide that's what they want, then I'm going to get on the light rail."